WOW! It has been 12 WEEKS! I admit I took a peak at the scale on Thursday—I was bummed. I was UP! I thought no way! But then this morning I got on the scale and again it was up. 🙁 I did not take a picture because…well it was depressing. 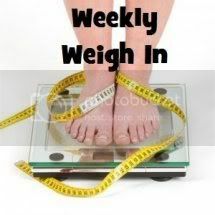 But just for the record the weekly weight in was 166.8. So I am up 1.2 pounds. While I was pouting and feeling sorry for myself I recieved some shocking news! My mom, who is only 50, had a heart attach. They did tests and confirmed it was a minor attach but damage was done. She is now set up to see a cartiologist next week to check for blockage,etc. This is especially upsetting considering my father died 10 years ago at the age of 53. He died of sudden heart failure! WOW! Talk about a wake up call! I realize how precious each day is! I want to grow old and see my kids and their kids grow. I know that we can not controll everything but I CAN control GETTING HEALTHY and TAKING CARE OF MY BODY! So now it is on! I know that last week was frustrating but I know that regardless of what the scale says I am creating a healthier body and lifestyle! AND… Joel (my husband) completed week 8. How did he do? Check out his guest post here. Ready for HIS weigh in? HE LOST 1 POUND this week! For a total of 20 pounds lost! He has pointed out that his weight loss has slowed down as well. Yes it is frustrating but we will push through! Your support is very important!Thank you for joining me on this scary yet exciting journey! Please also support my friends Heather at Our Kids mom and Melissa at Sippy Cup Momas they also share their Nutrisystem Experience and join me on this mission to LOSE! Join in the Nutrisystem Bloggers conversation on Twitter using #NSNation.